Diethood » Desserts » Mint Chocolate New York Style Cheesecake + Canon DSLR GIVEAWAY! 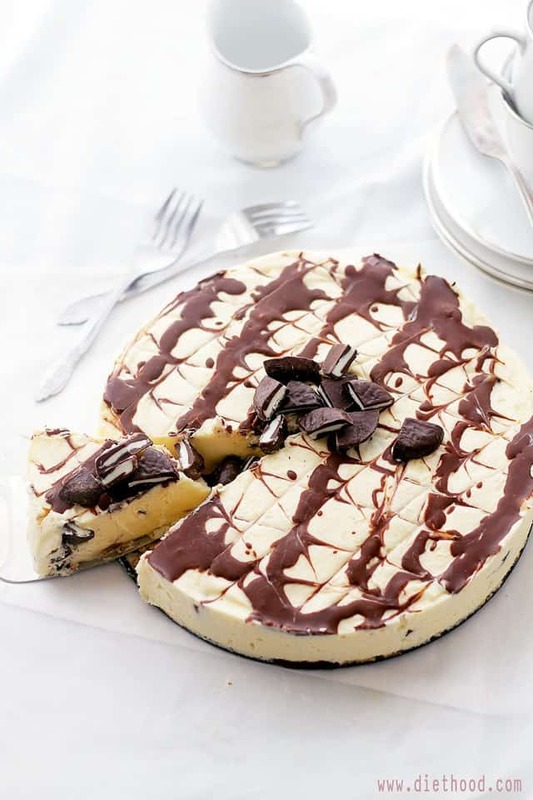 Silky New York Style Cheesecake filled with delicious pieces of Mint Chocolate. Errrrmahgosh! I have one thing to say; Mintiest breath, ever. EVER! If you have someone in your life suffering from Halitosis, for a lack of better words, send them this cake. Stat. However? Um… you know… I don’t even know. Sometiiiiiimes… I just get realllllly carried away. I saw cream cheese, I saw Andes-type mints (I’m cheap – alternative brands all the way! ), I saw cake. The following step involved a mixer and the next best thing happened; thy cheesecake was born. In all honesty, and is if you didn’t know, cheesecake is soooooo my thing. 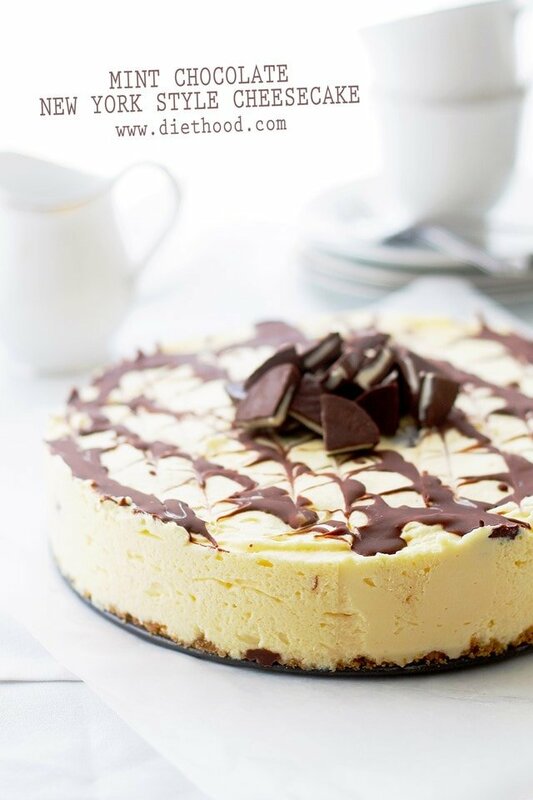 I’ve waxed poetic about my love for sweet cheesecakes – I ♥ cheesecakes! Have you tried my Pear Almond Cheesecake Torte, yet?? You really, really should…it’s incredible. BUT, my favorite, hands down, is New York Style. I can’t say that I’ve had anything better. This, this, THIS awesomeness is just that. AWE.SOME! I didn’t think the chunks of chocolate would work. I mean, I knew that it would taste as good as I imagined, but I just wasn’t sure if those chocolate pieces would stay afloat. The only thing I knew was that I could try the trick I use for my fruit muffins; toss the fruit in some flour, cross your fingers, and say five Hail Marys! So, I did that. And it worked!! Mint chocolate pieces were all over the place; top, middle, near bottom, to the sides… I loved it! And if you love yourself and your family, you will make this now. Yeah, right now! It’s necessary!! Sorry for the shouting, but that is also necessary. Also, also? I need to scream just one more time because, in case you didn’t notice, I’m giving away a camera! Yippeeeeeeee! Using a food processor, work the graham crackers into fine crumbs. In a medium bowl combine graham cracker crumbs and sugar. Pour melted butter into the bowl and mix until mixture is evenly moistened. Press crumbs evenly onto the bottom of a 9-inch springform pan. Bake for 7 to 9 minutes, or until crust starts to brown around the edges. In your mixer's bowl, beat cream cheese at medium speed until smooth. Add 1/2 cup sugar and continue to beat until smooth. Add whipping cream and peppermint extract; mix until thoroughly combined. In a bowl, combine chocolate mints and flour; toss until completely covered. Gently fold chocolate mints into the cream cheese mixture. Brush the sides of the inside of the springform pan with melted butter. Bake for 50 to 60 minutes or until edges are set; center of cheesecake will be soft. Turn oven off and open oven door about 4 inches. Let cheesecake sit in oven for 30 minutes. Transfer pan to a wire rack and let completely cool. Carefully remove sides of pan. I can’t believe it is already St. Patrick’s Day next week!! In honor of this Springy green holiday I have a BIG surprise for you! I am teaming up with some of my favorite bloggers to bring you an incredible giveaway! Have you ever wanted to try your hand at photography but felt limited because the gear can be pricey?? Well you’re in LUCK! 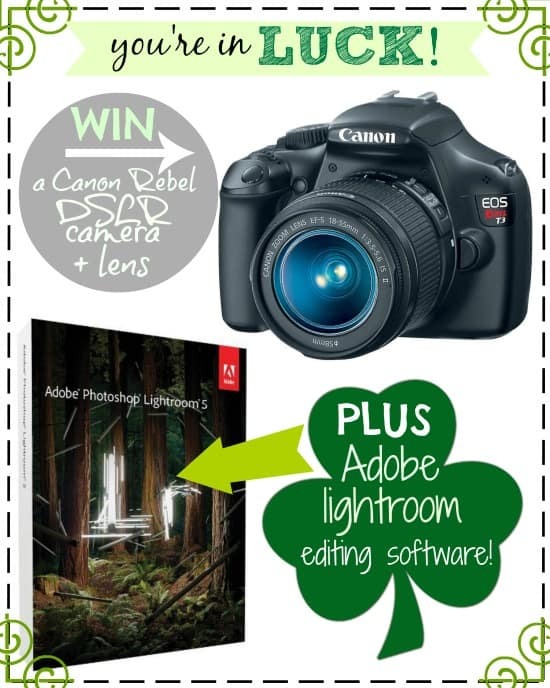 Today is your chance to WIN a Canon EOS T3 Digital SLR Camera! And there’s more! We’re hooking you up with Lightroom photography editing software so you can get that professional quality you love, add captions and special effects, and so much more! You can earn 28 entries today! All you have to do is follow some great blogs and enter through the Rafflecopter below! Mmmm cheesecake. One of my favorite things to bake, and my family loves to eat it. Such a beautiful cheesecake! Mint chocolate is a favorite combo around here. I know this wouldn’t last long at my house. 🙂 I hope you are having a good weekend! Wow… that is one amazing cheesecake. So pretty! Your cheese cake looks fabulous! I’m a cheese cake addict so I’ll have to give your recipe a try. I’ve been trying to win a camera for a long time hopefully, the rafflecopter gods will be looking my way! Best of luck to everyone! You nailed it again Kate! 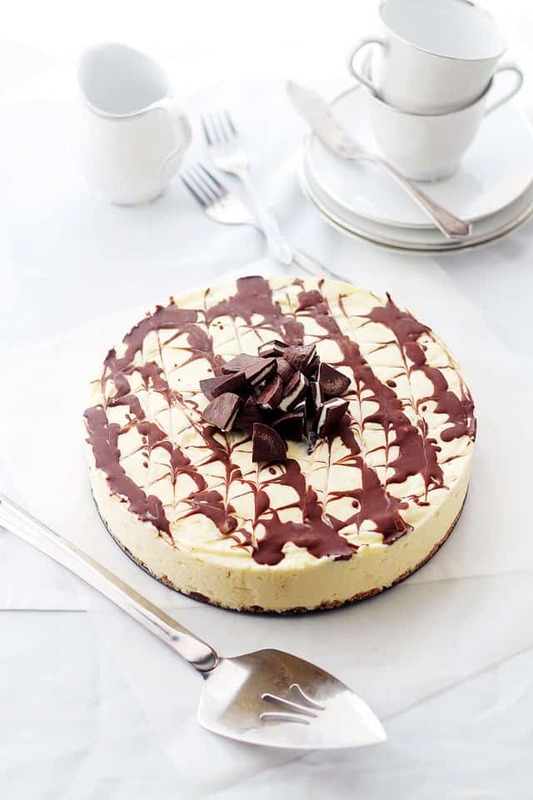 What a dreamy cheesecake, love the mint chocolate combo! Ohhhh my gosh this looks SO good! I have a serious weakness for cheesecake. Yum yum yum. I love mint chocolate. Love it. That is one killer cheesecake! Gotta be honest though, the giveaway is kinda stealin’ the show. LOL!!! I know! 😀 It’s all good… enter and good luck!! Haha, this beats chewing gum! Mint chocolate and cheesecake in the same sentence sounds shout worthy to me. 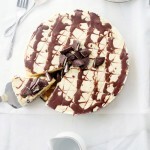 I love cheesecake – this is right up my alley! That cheesecake is seriously to die for!!!!!! Holy cow I am in love! !